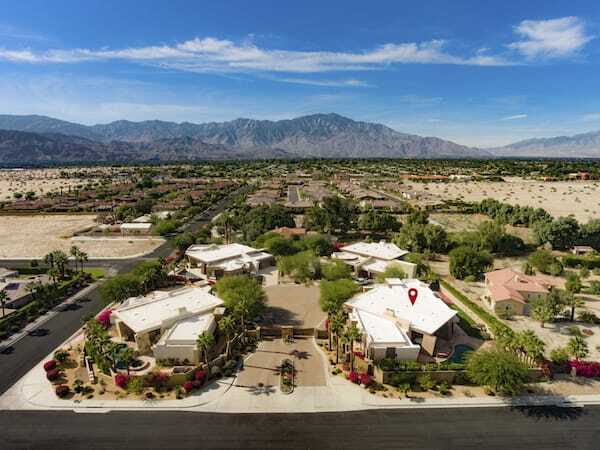 Natural finishes distinguish this custom Rancho Mirage estate that's part of a private enclave of just four homes. The backyard amenities include covered living and dining areas, a sculptural pool and spa, a grill, full audio, a three-zone misting system, and a fire pit. Local architect Narendra Patel has designed commercial and residential buildings throughout the desert and in numerous countries — including more than two dozen projects in China — and his affinity for natural elements is on full display in this custom Rancho Mirage home. The estate, which is currently on the market for $1,849,000, is one of only four properties in a quiet, gated development that feels private yet is close to all of the city’s shops and restaurants. An angled pivoting glass door is your introduction to an open-plan great room distinguished by 14-foot ceilings, limestone floors, and oversized glass windows and doors that fill the four-bedroom, 5.5-bathroom, 4,650-square-foot house with natural light. “The interior is open, airy, bright and has a great flow for entertaining,” says real estate agent Richard Bartholomew of The Agency. The expansive great room also has a sunken-bar and a fireplace with a dramatic angled limestone surround. Some of the home’s additional features include Lutron lighting, a 12-camera security system, office, and gym, plus each bedroom and the garage have their own air-conditioning units which enhances the home’s energy efficiency and personalization. The open-plan great room is distinguished by 14-foot ceilings, limestone floors, and oversized glass windows and doors that fill the house with natural light. 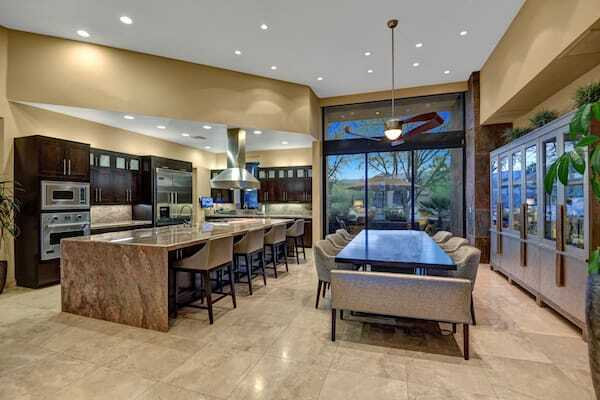 The chef’s kitchen, adjacent to a spacious dining area, is outfitted with commercial-grade Viking appliances, a wine cooler, and a large granite island with waterfall edges and under-counter seating. The chef’s kitchen is outfitted with commercial-grade Viking appliances, a wine cooler, and a large granite island with waterfall edges and under-counter seating. The master bedroom and en suite also feature natural limestone finishes — on the bedroom’s fireplace and the en suite soaking tub that’s centered under a large picture window — along with a frameless glass shower and his-and-her closets. Natural limestone finishes are featured throughout the home including in the master ensuite. Walls of granite flow from the interior to the outdoors where the backyard amenities include covered living and dining areas, a sculptural pool and spa, a grill, full audio, a three-zone misting system, and a fire pit, plus a volleyball area and a lit sports court. 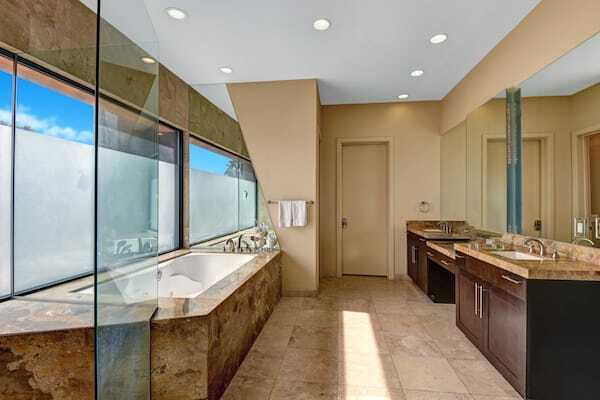 1 Seclude Court, Rancho Mirage. For more information, contact Richard Bartholomew, 760-895-7104, RichardB@TheAgencyRE.com. The 4,650-square-foot home is one of only four properties in a private, gated development.